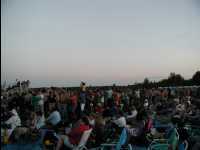 kelly's Winnipeg Folk Festiva 2000 picture page! All the thumbnails shown on one big page. It may take a while for you to load it. Even the enlarged pics are very scaled down (originals are truly *huge*, at 2048x1536) from an Olympus 3030 digital camera. If you want a full-size pic for your desktop, just email me the picture# and I'll send it to you. Here's a great example of what 2048x1536 looks like. It's David Nields standing in a pool of mud, right in the middle of the audience, while the rest of the Nields were on the main stage. Just like "where's waldo?" can you find him? what? pictures and a little story. who? Kelly Martin, a boy not a girl from Calgary, Alberta. Click on any of the pictures to go to the slideshow view or go to the thumbnail view. 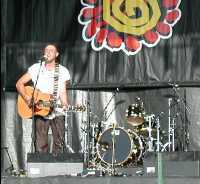 My trip to the 2000 Winnipeg Folk Festival started out in classic Kelly fashion, with me managing to leave my brand new zoopah-expensive digital camera on the plane. Arrgh! It wasn't even a week old and I fear I may have hurt its fragile feelings by abandoning it, already. I've flown a thousand times and have so rarely had any desire to take a picture from up in the sky, seeings as the windows are always so murky and I tend to be daydreaming of a day when I should never need to land... but I left the camera nonetheless in the seat pocket in front of me, with my tray table raised and my seatbelt fastened, as instructed of course. Walking through the airport I realized my error and it wasn't until days later that I found the self-portrait taken by the crazy WestJet staff who had found it. The discovery of this picture at the front of my photographs was worth a good giggle. 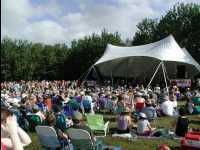 The Winnipeg folk festival is simply the coolest annual music festival on the planet. But first things first. You need to understand the magnitute of this place. 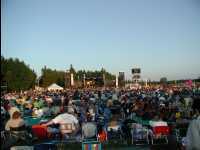 The Winipeg folk fest is huge, something like 34,000 people go each year. And I am there too, right at the front. 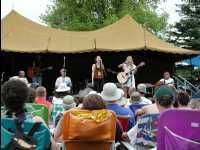 And more importantly, it is the quintessential, the ultimate, surely the best place in Canada to check out a wide variety of (especially) singer-songwriters and cool music in general, from all around the world. This picture is of the main stage, from waaay back near the food area. From that far away, the performers are just little dots. You can to watch the jumbo screen, and even then your eyes go buggy. Well anyways, on with the show (and the performers). 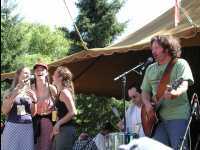 Let's start with the ultimate: the Nields and Martin Sexton hammin' it up on stage together. That's Martin's drummer Joe in the background, and the girl in the black shirt is actually Jorane, who isn't a part of the Nields at all but actually a singer/songwriter herself from Quebec who appeared (to me, at least) to be really in touch with herself and her emotions. So much so that it was eerie. I must admit that I didn't *always* make it to the absolute front of the audience, right next to the stage. I mean, there are times when a guy has to eat, you know? This pic is taken from faaaaaaaaaar away (by my standards, at least hehe) and it's of the Nields again, probably playing 'Best Black Dress' or something similar. Too bad you can't see the rest of the band in the background, because they all just just totally rocked! Katryna Nield's bright red bowlong shirt though, well I'm not a big fan of THAT. haha. I kept looking down to see if she was also wearing the shoes... but it was far too muddy that day. And speaking of mud. There was enough of it to be had by all. hehe Really, the fact of the matter is that it only rained the very first night, Thusday, but that was enough to have mudified the entire festival for the rest of the weekend. In the coming days, all people would talk about is the rain. Rain, rain, like the rain had never stopped. Like it was the worst rain in the history of the festival, perhaps the worst rain in the history of the world. It seems to me that everyone had already forgotten about the great floods of Winnipeg back in the mid-1990s. Me, I had kind of forgotten about the rain by the time I had woken up and jumped outside my tent. "Oh, I guess it rained last night" was all I could seem to say. 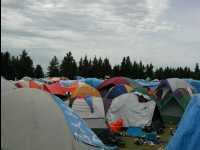 As you can see, there were hundred (maybe thousands) of tents in the campground. They were everywhere. And the campground at night? It was truly a carnival of laughter, though I will leave the descriptions and feelings of such for another story... I even managed to find a dinosaur foot in the mud, much to my surprise. That's the nice thing about walking through mud up to knees and then through a bit of sand -- your feet get kind of coated, like shake-n-bake chicken, and you just stand around and wait for someone to chomp. [Ahem] I seem to be getting a little distracted. Let's get back to the music, shall we? 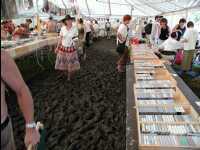 This picture of the festival store gives you a good idea to what extent there was mud. It was much fun walking through there, navigating people as you slip and slide your way around. That day I managed to replace my favorite, autographed Nields CD 'gotta get over gretta' with a new one (because I lent mine to a friend and never got it back...), along with some Hawksley Workman, some more Ellen Thorn, and surely a bunch more than I can't think of at the moment. There were lots of other cool people at the festival too, many of whose CDs I already seem to own, like Dan Bern and Dar Williams, each performing on the main stage. At this point I have stopped writing for a second to take a look at what this page looks like. A little cramped, near the bottom I think, so it stands to reason that I need to perhaps put in a little bit more commentary. You know, like they say on the radio on all those awful classic rawk stations, except in reverse: more talk, less rock. And that's what I'm really good at, less rock. haha. Really, I have come to the conclusion that you can only make a web page so cramped, and after that people started to get pissed off. So, that being said it's time to move on to page 2.